- Fixed acceptance of international jobs not working. - Stephen Carr no longer is retired when a new game is started. - Fixed bug where homegrown players at a B team weren't being treated as homegrown for the A team. - Adjusted filling of empty attributes for non-players. - Fixed player listed as 'Unh' no longer will have no evidence that they are unhappy on their personal section. - Improved selection of feeder clubs offered. - Fixed a problem with the days in Britan for players who have played in England and Scotland (e.g. Mark Viduka). - Fixed a data corruption in the contract offer screen that occasionally caused strange low wage requests. 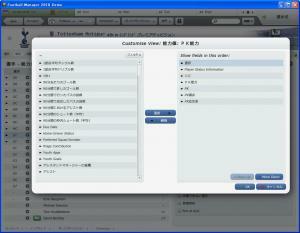 - Adjusted newgen starting attribute levels. - Adjusted goalkeeper ability development. - Adjusted quality of newgens produced in both active and inactive leagues. - Fixed highest and lowest league position records not updating properly after team has moved between regional divisions. - Fixed bug where clicking on the scouting shortcut would take you to the squad page instead of scouting knowledge when the club has no scouts employed. - Added tooltips to graphics rating stars on Preferences screen. - Fixed bug where Match Preview screen was missing team and competition links. - Latest scores, goals updates and live league table panels on the competition screen now update correctly. - Added text to indicate that there are no available player interaction options instead of just displaying a blank screen. - Added ok dialog to job centre panel to show manager that their advert has been placed successfully. - Fixed 30-second unresponsiveness when going manager chat. - Removed option to apply for a job from team action buttons if the user has already been offered the job. - Fixed player's training panel not displaying any info if club did not have a physio. - The classic player instructions panel now includes the Wide Play instruction. - Made it impossible to just search with a key containing just spaces, as doing so would cause a very lengthy wait for the search to complete. - Ensure news respond buttons are properly cleared down when manager resigns. - Ensured coach reports aren't available for unattached players that have been scouted. - Show 'Sus' indication on national pool if player has international ban. - Ensured coach reports aren't available when making an offer for a player that isn't attached to your club. - Fixed potential crash if user clicked on search icon and then on status panel whilst setting up a new game. - Stopped staff contradicting themselves when suggesting removing offers for players even though they gave them a good scout report. - Improved the second opinion advice. - Stopped fitness coaches offering advice on tactics unless they also have a preference for a normal coaching role. - Stopped second opinion always disagreeing with team attribute comparison pre-match advice. - Using the Training button now links to the teams training section correctly. - Advice no longer re-appears if you have dismissed the advice by going to the screen via the news item and then going by the menu link. - Improved the recommended player’s advice AI. - Stopped Assistant Manager disagreeing with possible opposition instructions and then suggesting them himself pre-match. - Scouting recommendations for immediate signings only recommend players the team can currently afford. - Backroom advice section now hidden for international matches because there was never anything to show. - The scroll buttons on the tab strip now works correctly. 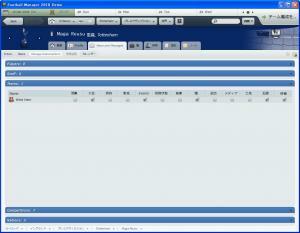 - Can now add national team achievements for people in the editor. - Adding new clubs, competitions, etc to the database now applies the same changes to network clients as well. - Fixed 'interested in job' news item not always knowing whether the job the person is interested in is currently filled or not. - Fixed comp news item which mentions several teams they could face in next round when next round opponents are already known. - Fixed over-the-top news strings for winning friendly competitions. - Fixed Transfer Centre button displaying on transfer offer news when human not involved in transfer. - Added 'Make Offer' button to transfer offer news so human can easily make counter-bid for players who have just come under offer from other clubs. - Players no longer complain about been unable to speak to another club when a transfer offer is negotiated rather than rejected. - Players no longer complain about been unable to speak to another club if the buying team keeps delaying the transfer. - Fixed "Consortium pull plug" news item stating consortium pulled the plug when it was actually the club. - Fixed player's bio blaming manager for club's season under-performance when manager has only just joined and is doing well. - Fixed rare instance of player transfer speculation news being generated for news where the buying team doesn't have a manager. - Fixed View Injury Table button in physio report news occasionally taking you to the wrong page for an international manager. .- Can now appeal straight red card when a player was playing for a different squad to the squad he is currently in. - Stopped media speculating about managers signing rubbish goalkeepers. - Pitch dimensions news item only sent if there are more than one pitch size to choose from! - Fixed occasional non player bio referring to club join date as 1. Jan. 1900. - Adjusted clubs going into administration. - Adjusted player wage demands. - Adjusted wage budgets for very small teams. - Fixed players on very high wages requesting a lot less when renewing contract. - Prevented board from stepping in and accepting bids just over the basic value of the player on behalf of a manager when player was transfer listed. - Disabled transfer decision deadline option of 'Today' when current game time is later on in the day and not possible for clubs to respond in time. - Loaned out players no longer kept in first team and demoted to reserves upon return to club. 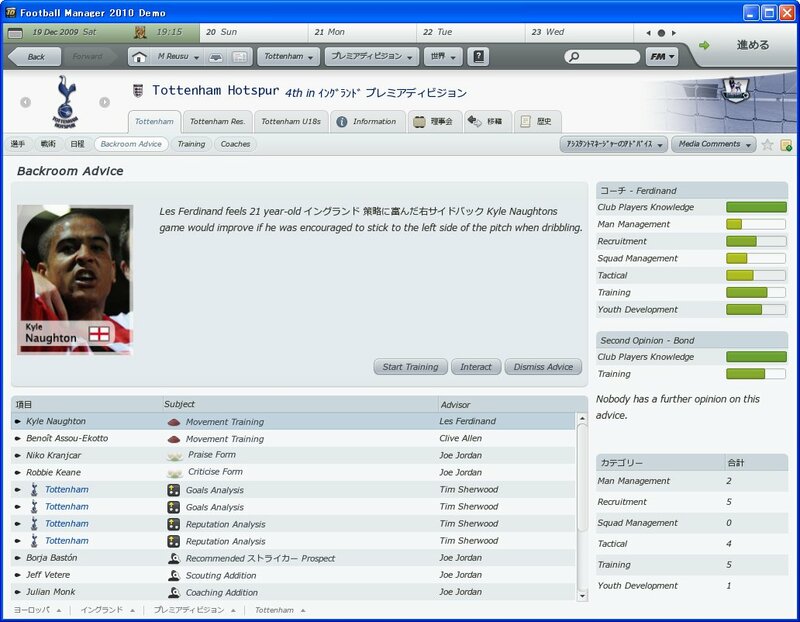 - Removed duplicate news item when a youth player’s contract expires. - Altered contract decision code to prevent low league key players from getting early pay rises. 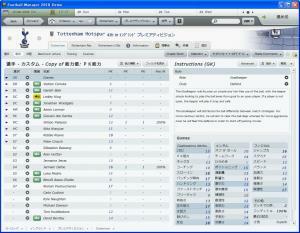 - Fixed occasional first team player being put in reserves and listed for loan in first season. - Fixed journalist asking about signing a compatriot for a new signing when other club team already contains a player of his nationality. - Fixed follow-up question about balancing books appearing in the wrong context in new signing conference. - Miscellaneous text and press conference question fixes. - Fixed press conference questioning team's form due to poor morale when team morale is actually very high. - Improved selection of the main talking point of press conferences. - Give precedence to team-mates of the same nationality over shared language when looking for a team-mate who can help a new signing settle in. - Fixed wrong stadium name being shown in some new signing conference questions. - Stopped non-players who dislike a club from leading consortiums that are interested in taking them over. - Now cannot join manager chat until you have completed adding a manager. 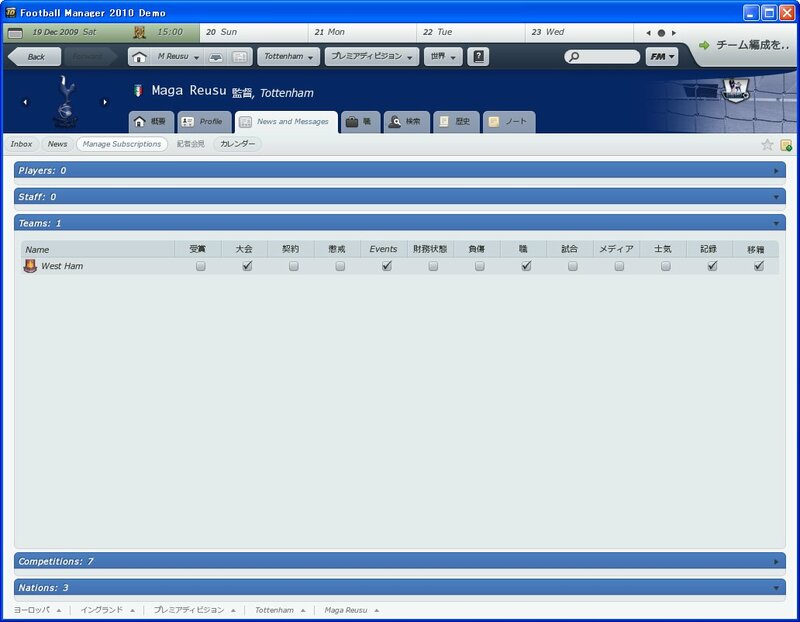 - Fixed blank stage in add manager wizard when "Assign Random Clubs" has been ticked. - "Disconnect" action is now shown again on the game status screen for network clients. 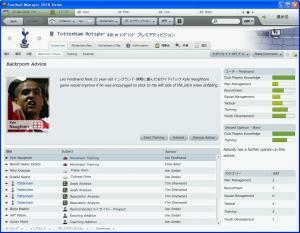 - Fixed other managers watching a match being able to view the playing managers feedback widget. - Fixed bug where user-named friendly competition gets its name changed to Friendly Cup after saving and reloading. - Injury icon now no longer appears above a player in a match if the match is rewound to before the injury. - Fixed pitch textures been inconsistence between 2D and 3D view. 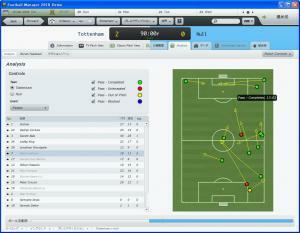 - Fixed bug where playmaker and target man roles were not being setup correctly in the match. - The first team now always uses the first kit when playing in the intra squad friendly.